In order to meet out the requirements of neutral refractories where safe working temperature is not more than 1300 deg cent. 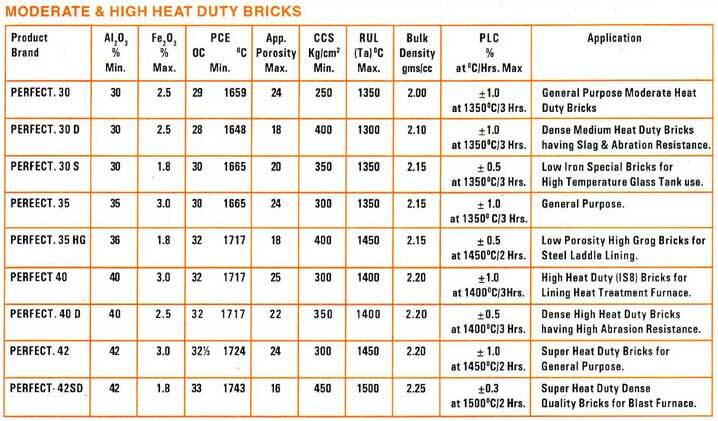 we are manufacturing Moderate Heat Duty bricks of standard/special shapes and size as per customer requirements.We manufacture these Moderate Heat Duty bricks by adopting wet process technology which results in developing very high compressive strength in our bricks ,thereby improving the performance ..For the places where safe working temperature is more than 1300 deg cent we recommend High Heat Duty Bricks & Super Heat Duty Bricks to our customers. These Moderate & High Heat Duty Bricks are generally used in Cast iron foundaries, Cupolas, Rolling Mills, Lancashire Boilers, Rice Mill, Mini Steel Plants, Boiler Arches, High Pressure Boilers, Checkers of open hearth furnaces, Oil fired furnaces, Glass Factories & Other miscellaneous industries.